This is the second booklet that I made. The first one was the proto-type "dots." 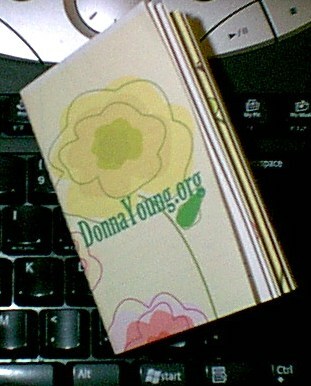 The booklet shown below measures approximately 2.75 x 4 inches and has 30 pages. It was printed on two sheets of paper and all of the instructions in this section are based on printing the booklets on two sheets of paper. I am not sure why anyone would make one of these booklets when they can drive to their nearest office supply and get something superior. I can think of several reasons why a person would want to make one.